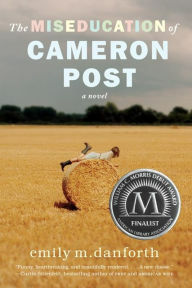 After reading, and loving, DEVOTED in preparation for a writing retreat, something joggled in my brain and I pulled a title from my sorrily epic TBR pile: THE MISEDUCATION OF CAMERON POST. What a read-beside pair! Both titles deal with teen girls who feel that they don't fit--perhaps cannot exist--within the moral and social confines of their communities. In, THE MISEDUCATION..., Cam is a scrappy, only-child orphan living in a highly traditional Minnesota ranching town with her unmarried aunt and diabetic grandmother. And, she is a lesbian. In, DEVOTED, Rachel is one of 10 children in a fundamentalist Texan family, lead by her father, and guided by the pastor of the Christian church they faithfully attend. And, she dreams of being more than a wife and "helpmeet" after high school. Both Cam and Rachel are reviled for the things that make them different, which leads them to feel the pull of love for family members pushing against the need to become their most complete selves. Both Cam and Rachel interact with other young women (Coley, Lauren) who have powerful impacts on their journeys. Both Cam and Rachel must confront the Bible--down to the actual interpretation of passages--and neither simply accepts nor rejects this book but instead really thinks about its content and its implications for "imperfect" followers of the text. It would be wonderful if happiness and fulfillment could be found by simply following a set of rules--be they biblical or otherwise. But writers and thinkers (and teens) know that nothing in life is all that simple. Here are two stories that help readers navigate the how-and-why, the-good-bad-and-ugly with thoughtfulness, intelligence and, ultimately, two unique kinds of grace.